On 17 January 2012, Royal Canadian Mounted Police (RCMP) Eurocopter AS350B3 C-FMPG, was destroyed and its pilot killed at Cultus Lake, near Chilliwack, British Columbia. According the Transportation Safety Board of Canada (TSB) final report, earlier in the day, the helicopter had deployed from Vancouver to a Canadian Dept of National Defence (DND) site at Cultus Lake. 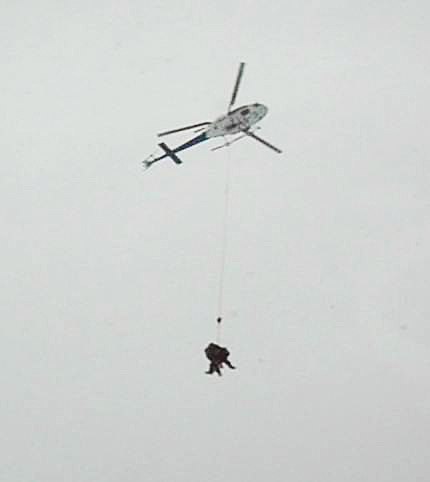 At 1145, the helicopter took off and carried out human external transportation system (HETS) training… HETS is a system used by the RCMP to transport personnel on a long line (about 100 feet) hanging below the helicopter. The flight was conducted during periods of intermittent, light snowfall. Approximately 35 minutes later, the helicopter returned to the landing site and was shut down so that the pilot could get some lunch and prepare for the afternoon’s training flights. When the helicopter was shut down it was not snowing, and the engine air inlet covers, which were on board, were not installed. During the lunch break, heavy snow started to fall and lasted for approximately 15 to 20 minutes. At 1315, the pilot decided to cancel the remaining training and return to Vancouver. Since shutdown, there appeared to be a significant accumulation of snow on the helicopter; the snowfall, however, had by then diminished to very light or none at all. The temperature was approximately –10°C. After the helicopter was reconfigured for the flight to Vancouver, the pilot entered the cockpit and prepared for start-up. At the same time, 2 ground crew members removed the snow accumulation from the 2 front windscreens. At 1349, the pilot started the helicopter, and the snow was flung off the blades. A significant amount of snow remained on the upper surfaces of the fuselage and tail boom. After lifting off into a hover, the helicopter climbed to approximately 50 feet above ground level (agl), and slowly travelled up and forward about 260 feet in a straight line before hovering for about 30 seconds at a height of 80 feet agl. Soon afterward, there was a muffled bang and a puff of grey/white vapour from the exhaust area, and the rotor revolutions per minute (rpm) decayed immediately. At the same time, the customary and familiar sounds from the engine rapidly disappeared, and the regular slapping sound of the rotor blades quieted significantly. The helicopter began to descend, turned quickly to the right about 150°, pitched nose-down briefly, and then descended more rapidly. During the final moments of the flight, the helicopter descended almost vertically, colliding with the terrain in a nose-down, right-side-down attitude. In all, the helicopter had been running for about 3 minutes. The helicopter was destroyed, and the pilot, the sole person on board, was fatally injured. The investigation determined that the accident helicopter struck the ground with a vertical velocity of 16.4 metres per second (m/s), which exceeded the designed structural capacity of the airframe. Even after the landing gear skids absorbed about 2 m/s, the airframe experienced a vertical velocity of 14.5 m/s. Mathematical modeling of the helicopter structural deformation revealed that the impact load factors on the airframe were between 15 g and 20 g forward, and between 40 g and 50 g downward. Once the g-force attenuation limit of the pilot seat was reached, the g forces were then transmitted to the pilot, since the seat had by then stroked to its limit, making contact with the cockpit floor below it. Furthermore, the forward and downward g-force vectors must be combined to arrive at the total impact force transferred to the pilot. In this accident, the design certification basis for the seat was grossly exceeded, and the pilot experienced impact forces in the order of 35 g downward and 17 g forward, values which far exceed human tolerance. 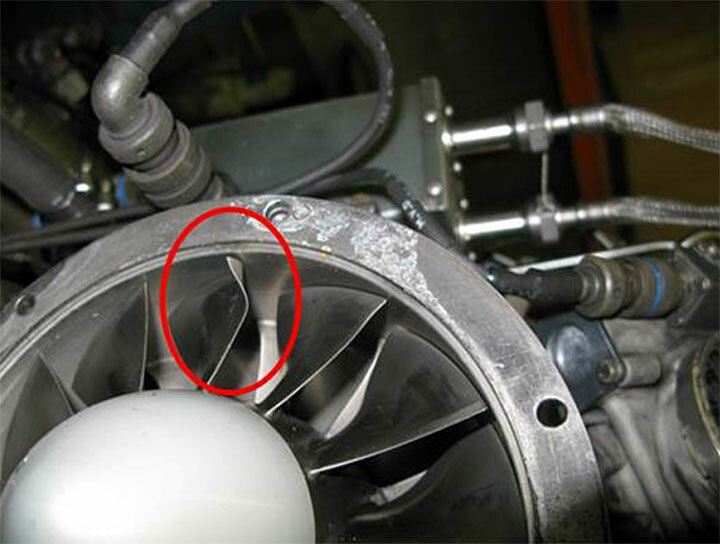 Examination of the Turbomeca Arriel 2B engine inlet section revealed significant damage to one first stage compressor blade, although all blades had some damage. The damage appeared similar to the bending incurred by the axial compressor blade(s) during certification testing when snow and ice was purposely ingested in the engine at maximum continuous power. The bending of the accident compressor blade was somewhat greater than that seen in the test compressor blades, so the TSB concluded that the engine in C‑FMPG was operating in a similar, high power condition when the ingestion occurred. According to the manufacturer, the ….engine consumes about 5 pounds of air per second; this translates into an air flow of about 330 feet per second passing into the engine axial compressor disc. If the engine inlet (approximately 5.75 inches in diameter) becomes blocked, it could cause a loss of power. As well, as a result of the airflow speeds entering the plenum and engine intake, a reduction of air temperature takes place as the air moves through the engine’s intake air plenum toward the engine compressor. Turbomeca computation results indicate the temperature at the engine mouth would be around –12°C. According to the report [on previous engine testing], the ingestion of approximately 83 grams of ice was required to cause the engine to flame out. The helicopter air intake had been equipped with a Eurocopter air particle separator (QB0550), more commonly referred to as the sand filter, to protect the engine from ingestion of airborne particles. By design, no part of the air intake system was heated. …with the sand filter installed, the inlet screen does not incorporate the quick-removal fasteners. 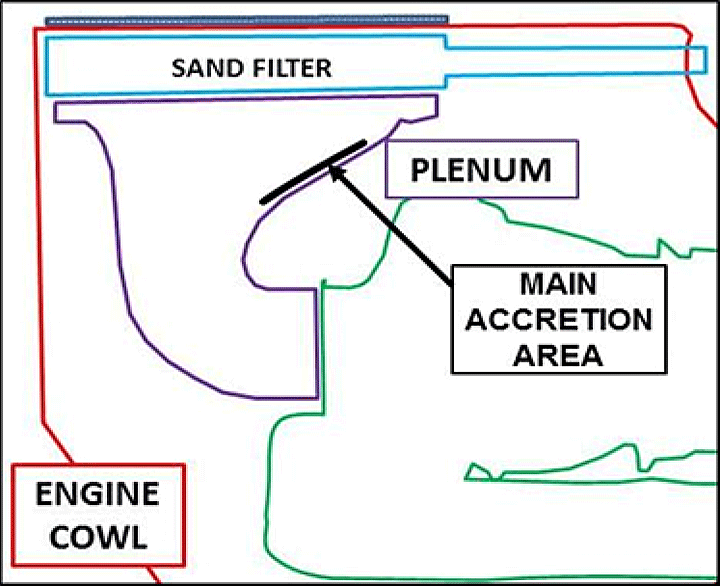 Inspection of the plenum can only be accomplished by opening the engine compartment. Also, to inspect and clean the sand filter, the inlet screen must be removed, requiring the removal of 20 bolts. This level of disassembly is not work that can be accomplished by a pilot, so the sand filter could not be inspected or cleaned without an aircraft maintenance engineer (AME). Previous testing had shown that snowflakes “refreezing in some air intake areas may lead to ice accretion, which may be ingested by the engine due to warming, vibration or a combination of both”. In an effort to reduce the risk of engine flame-outs during snow operations, Eurocopter issued a series of service letters and manual amendments dealing with the protection of the AS350 while being operated in falling snow and during periods of cold weather. Although [a key document] Information Notice (IN) 2302-I-00 (issued in January 2009)was not circulated to RCMP pilots, the critical information was in the RFM supplements. Based on the circumstances of this occurrence and the well-documented history of engine flame-outs associated with water, snow, or ice ingress, the investigation determined that the cause of the loss of engine power was a sudden change in the critical air/fuel ratio as a result of soft ice ingestion. While it is impossible to know for sure how much soft ice was ingested by the engine, the damage to the compressor blades suggests that the amount of soft ice striking the blades was larger than the amount seen in the certification tests. 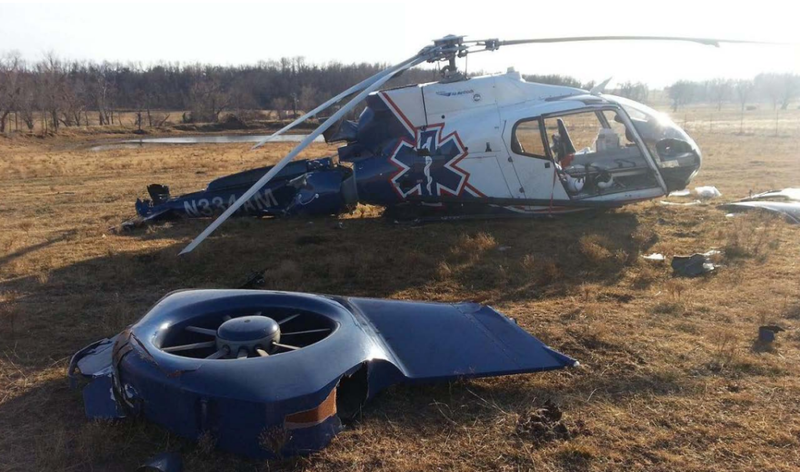 When the helicopter experienced a loss of engine power, which occurred while hovering at approximately 80 feet agl, the helicopter would not have had sufficient altitude or time to fully enter autorotative flight. As a result, the pilot would have had little opportunity to preserve main-rotor rpm (rrpm), and a high rate of descent would have developed rapidly. As the helicopter descended, the rapid decay in rrpm resulting from the engine power loss reduced the effectiveness of the flight controls, leading to an impact with terrain that was beyond human tolerances. The lack of auto-ignition systems for single-engine helicopters like the AS350 places pilots and passengers at increased risk of an accident following an engine power loss at low altitude due to snow, water, and/or ice ingestion. The decision to operate the AS350 was not supported by an in-depth analysis of mission-related risks and probable outcomes associated with an engine power loss. The risk of soft ice accretion associated with cold weather operations was not well appreciated by the operator, and the steps to inspect and clean the air intake system as outlined in the RFM were not practical for field operations. No additional risk-management steps were taken to identify hazards associated with HETS operation using a single-engine helicopter, particularly during winter. 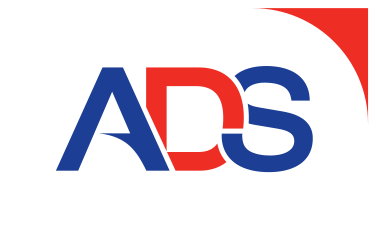 If detailed risk assessments are not carried out when introducing a new aircraft type into an operation, there is an increased risk that any associated hazards will be undetected. 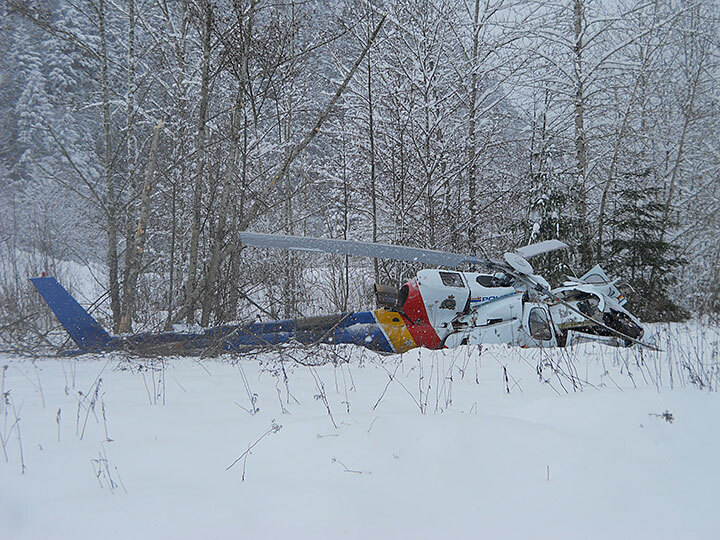 The available protective covers for the airframe and the engine air intake were not installed when the helicopter was shut down or when heavy snow began to fall. In addition, preparation of the helicopter for flight, by removal of the accumulated snow from the airframe or the air intake, was not carried out as required by the rotorcraft flight manual. Water accumulated in the engine air intake system, and ice or compacted snow built up in the engine air intake plenum after start. The helicopter experienced a complete loss of engine power resulting from a sudden change in air/fuel ratio caused by ingestion of the contaminant. The helicopter’s power loss occurred at an altitude and airspeed that did not permit an autorotation, which led to a rapid loss of main-rotor rpm and an extremely high rate of descent. Canadian regulations require that the manufacturer’s instructions be complied with fully. 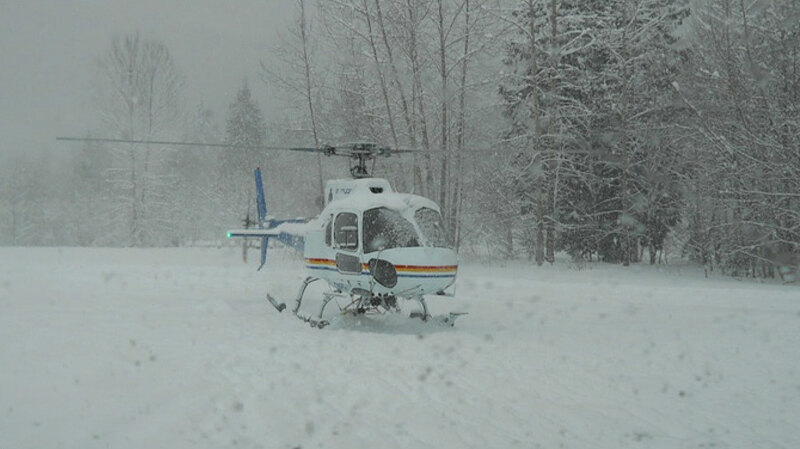 Transport Canada advises that it is imperative that the engine inlet (plenum) of the AS350/EC130-type helicopter be free of all snow, ice, and liquid water before starting up in cold weather operations and/or snowy conditions. However, compliance with these instructions for the inspection and cleaning of the engine inlet (plenum) of the AS350/EC130-type helicopter cannot be done without elevating and supporting the engine cowling or, where installed, removing and reinstalling the grill that covers the filter. These tasks cannot easily be accomplished in field operations, which significantly limits operators’ ability to operate in some weather conditions. Therefore, the Board is concerned that, in certain cold weather conditions, when the manufacturer’s instructions are not fully followed, AS350 and EC130 helicopters are at increased risk for engine flame-out shortly after take-off. A number of actions by the RCMP are discussed by the TSB. Eurocopter issued Safety Information Notice 2645-S-30, in October 2013 applicable to AS350, AS550, and EC130, regarding ice and rain protection. 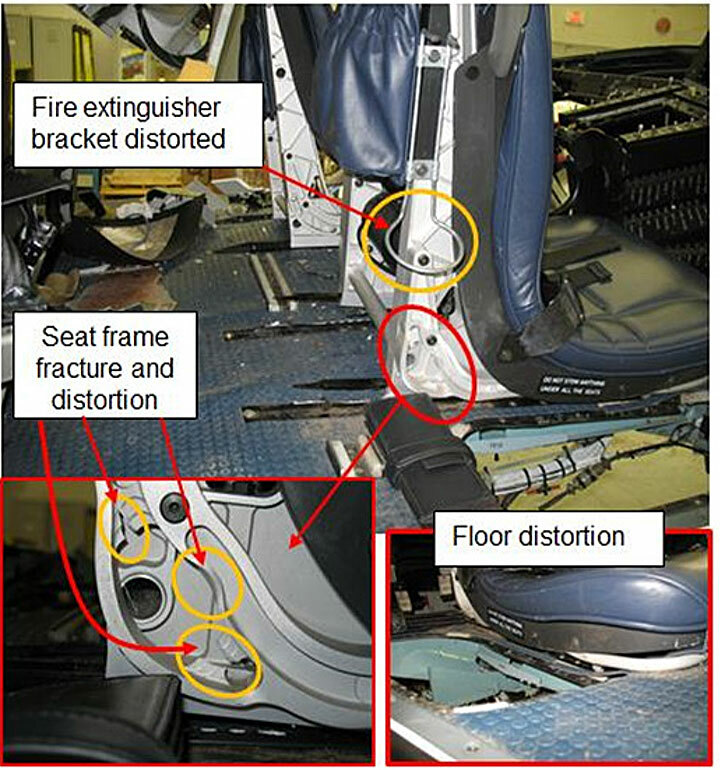 Transport Canada then published Civil Aviation Safety Alert (CASA) 2013-03 in November 2013 to raise operator awareness of the problem with moisture collection in the intake plenum chambers of the AS350. The CASA includes a strong caution to avoid the shaded area of the height velocity curve wherever possible. 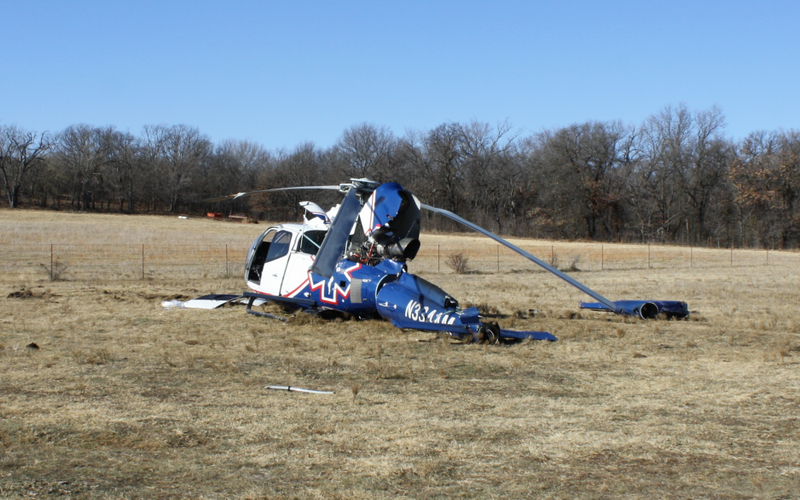 Less than a year later, on 2 January 2013, Eurocopter EC130B4 HEMS helicopter N334AM operated by Air Methods, experienced a hard landing following a loss of power from its Turbomeca Arriel 2B1 turboshaft engine near Seminole, Oklahoma. The pilot and three medical crew members were all seriously injured. …received a standby call for a response to an accident scene. The pilot checked weather for the flight. He went and removed the helicopter inlet cover and the flight was requested to launch. The pilot performed a walk around inspection of the helicopter and started the helicopter normally. Shortly after takeoff, while climbing through 1,600 and 1,700 feet mean sea level (msl), the pilot heard a sound like something had struck the helicopter and the engine stopped producing power. The pilot had limited recollection of the next events but recalled that while performing an autorotation, he made a right turn to an open field. While maneuvering to land to the field he saw a previously undetected barbed wire fence. The pilot maneuvered the helicopter over the fence and [a] crew member reported seeing the sky through the forward windscreen before they impacted the ground. 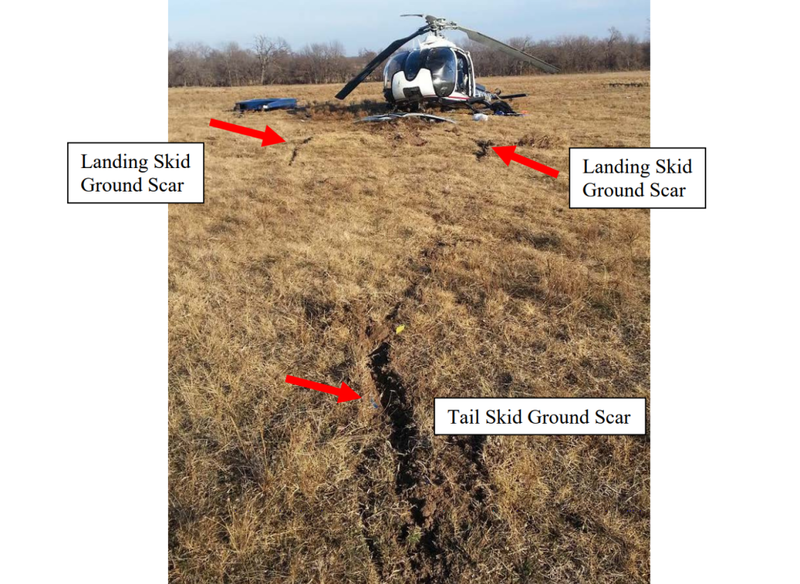 The location of the ground scars relative to the final resting position of the aircraft was consistent with a clockwise rotation of the aircraft of approximately 180 degrees following initial ground impact of the landing skids and the tail skid. A barbed-wire fence was located approximately 16 feet west of the single tail skid ground scar and approximately 54 feet west of the main wreckage. 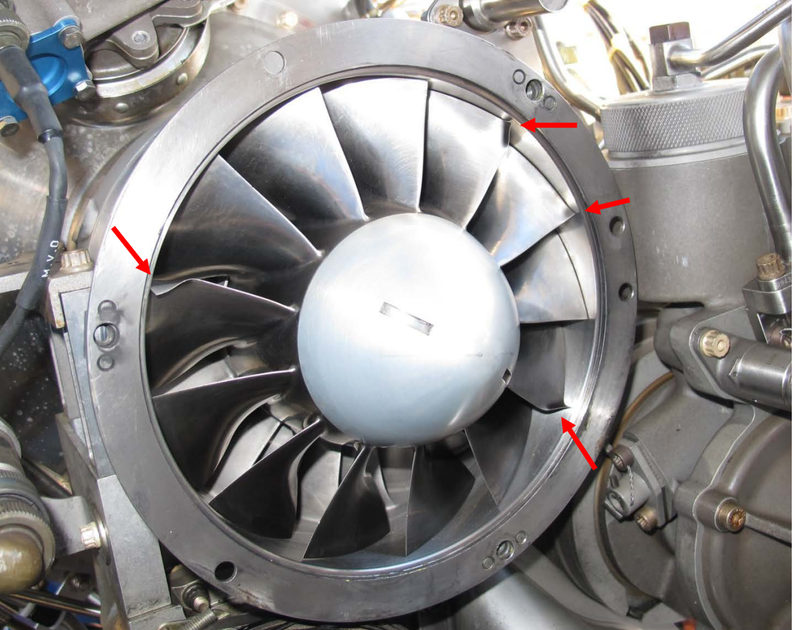 Engine examination revealed that the four axial compressor blades exhibited significant deformation on the outboard tips of their leading edges in the direction opposite of normal rotation consistent with the ingestion of soft body foreign object debris, such as ice. For 3 days before the accident flight, the helicopter was parked outside without its engine cover installed and was exposed to light drizzle, rain, mist, and fog. The engine inlet cover was installed the day before the accident at an unknown time. The helicopter remained outside and exposed to freezing temperatures throughout the night until 2 hours before the flight. Although the helicopter was maintained in a ready status on the helipad and maintenance personnel performed daily preflight/airworthiness checks, the inlet to the first-stage of the axial compressor was not inspected to ensure that it was free of ice in accordance with the Aircraft Maintenance Manual. Based on the weather conditions that the helicopter was exposed to during the 3 days before the accident, it is likely that ice formed in the engine air inlet before the flight and that, when the pilot increased the engine power during takeoff, the accumulated ice separated from the inlet and was ingested by the engine and damaged the compressor blades.